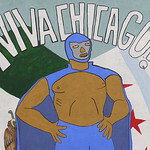 Viva Chicago - Blue Demon wrestler mural on Hubbard Chicago - Apathynow & Vindal - Design, Illustration, Murals, Wine design and wine t-shirts. 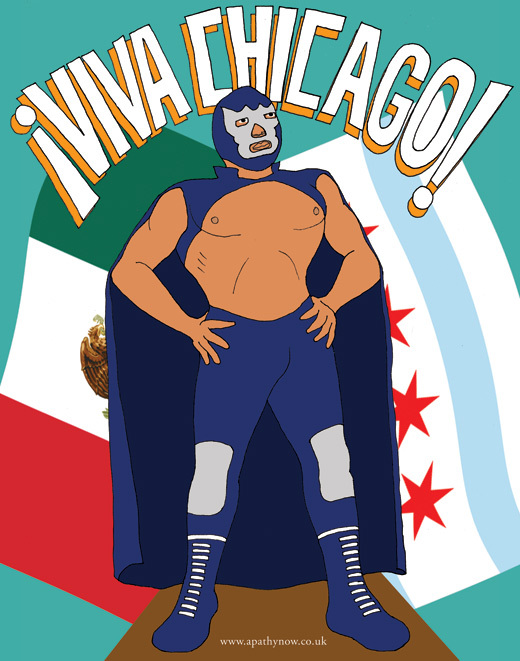 I give you… the great luchador, Blue Demon! It all began a few years ago when I came back from a holiday in Jalisco, Mexico armed with a Chivas de Guadalajara futbol shirt and a love of their game (especially the headbutts), style and culture. I immediately got online to find people who could tell me more. I landed at a Mexican Soccer web forum. 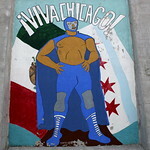 I am English, I had never been to Chicago and I knew very little of that great city or its people prior to ‘meeting’ several Mexican-Americans via this online forum. They were passionate about the game and the old country but also about their city, Chicago. They even set up a thread dedicated to it, its places and its unique style named “The Chi-town thread (best city in the US)”. Amongst all the chat about the architecture, the galleries, the clubs, the best places to watch football, the best places to eat Japanese, to eat Colombian, White Sox or Cubs, Mike Ditka, where serves the best bagels etc. etc. 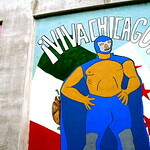 they told me about a great creative project there – The HUBBARD STREET MURAL PROJECT. It’s a wonderful thing. A beautiful, constructive use of the urban space. Something, I am proud to be part of. It’s a gallery for the people - perhaps people who probably wouldn’t think twice about going to a gallery but who enjoy art greatly via their purchases and film viewing. Not stuffy or high brow. Just how I like it. So, I went there for half a day (1.5 days rained off...atypically) & painted bits of it, in between crate diggin & sandwich scoffin. The rest was completed by some truly awesome people (Lisa, Kimberly, Thiel) while I was back in Blighty.